Warp your Sims back in time with the hottest looks and coolest décor from yesteryear with The Sims 3 70s, 80s, & 90s Stuff for PC. 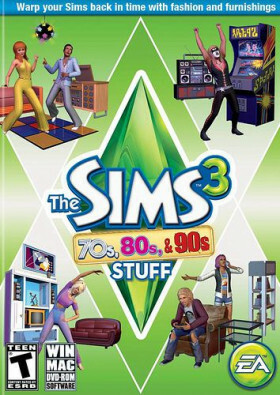 Now your Sims can sport a '70s disco look with a wide-collared suit and bell-bottom pants, go '80s glam with shoulder pads and bangle earrings or throw on a rumpled flannel shirt for a wild '90s grunge look. • Your Sims can get their grunge on in the gnarly '90s: Whether sporting the anti-fashion-grunge look in tattered jeans and layered tops or a casual-chic outfit featuring an asymmetrical skirt, Sims are sure to get mad props for their '90s fashion sense. Drag out the distressed furniture for an industrial metal vibe that says your Sims don't care about the establishment.